Char your onions and ginger by either placing them on a baking sheet under a broiler for 8-10 minutes or by charring them over a gas flame on your stovetop for a few minutes on each side. The onions and ginger should be nicely charred but still firm — this essential step will deepen the broth’s flavor. Once the onions and ginger are charred, remove the skin from the onion. Rinse the onion and ginger, and use a small knife to scrape off excess charred bits to prevent your broth from getting murky. Cut your chicken into parts, separating the breasts, legs, wings and backbone. This will ensure that your chicken cooks evenly and that the breasts will not become dry or tough when simmered. In a small skillet over medium heat, toast the cinnamon, anise and coriander until lightly browned and fragrant, about 2-3 minutes. Be careful not to burn the spices. Add the onion, ginger and chicken to a large pot. Fill the pot with 5 quarts of water. Bring the water to a simmer; skim the impurities as they rise to the top. After 20 minutes of simmering, or once they’re cooked through, remove the chicken breasts and allow them to cool. Add the toasted spices, salt and sugar to the pot. Continue to gently simmer the mixture for 1 hour. Remove the remaining chicken parts and strain the liquid through a fine meshed sieve. Bring the liquid back to a simmer for another 20-30 minutes, or until the liquid has reduced by about a quarter. This step will further deepen the broth’s flavor. While the broth is simmering, shred the chicken meat and reserve for serving. Once reduced, turn off the heat and add the fish sauce or tamari to the broth. Taste, and add additional seasoning if desired. While the soup is simmering, in a large bowl whisk together the matzah meal, salt, baking powder and baking soda. Add the beaten egg and schmaltz/oil. Add the scallions. Mix everything together until just combined. Do not over-mix. Refrigerate the mixture for at least 30 minutes, and up to a day. Form the matzah ball mixture into even-sized balls. You can determine the size based on your preference, but know that they will double when cooked. It makes it easier to form the matzah balls if you rub a little oil on your hands beforehand. Bring a large pot of water to a boil. Lower to a simmer and gently drop the matzah balls into simmering water. Place the lid on the pot and continue to simmer for 30 minutes. Once cooked, matzah balls are best stored in their cooking liquid. Add the shredded chicken, raw sliced onion and scallions to a bowl. Ladle hot broth into the bowl. Add the matzah balls to the soup. Serve along with basil, bean sprouts, lime wedges, hoisin and hot sauces. 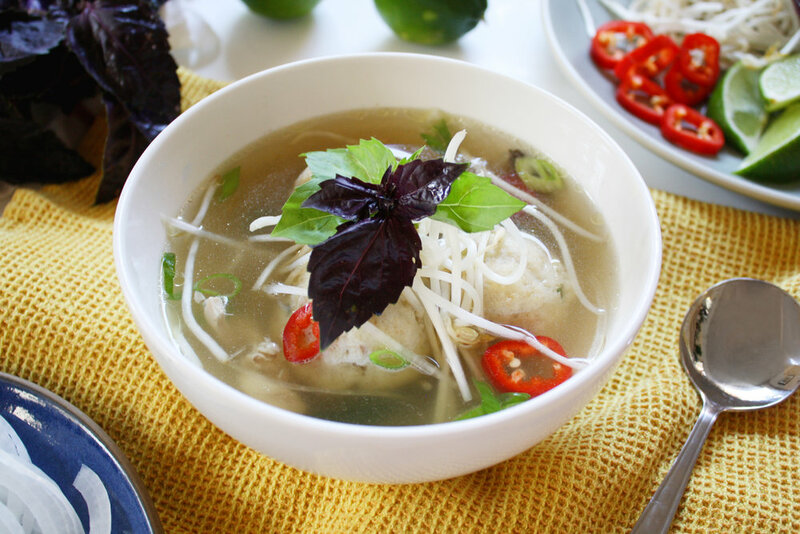 Allow people to garnish and customize their pho to their liking. Note about the recipe: Traditional Pho Ga calls for fish sauce in its broth. Fish sauce is made of fermented anchovies. Red Boat makes one that is certified kosher, but many who keep strictly kosher will not combine fish and meat in the same dish. To make this kosher, you can use tamari in lieu of fish sauce for extra umami flavor in the broth.